The diamonds from Alice's dismantled tiara were also used to make Philip's wedding present to his bride: an elaborate diamond and platinum bracelet, also made by the jewelers at Philip Antrobus. The wedding ring given by Philip to Elizabeth is made of Welsh gold. It's become tradition for British royal brides to wear Welsh gold wedding rings. In 1923, the Windsors were given a nugget of gold mined at the Clogau St. David's mine in Bontddu. The gold from that nugget made Elizabeth's ring, as well as the wedding rings worn by the Queen Mother, Princess Margaret, Princess Anne, and Princess Diana. Subsequent rings, including those worn by the Duchess of York, the Countess of Wessex, the Duchess of Cornwall, and the Duchess of Cambridge, have also been made from other pieces of Welsh gold. Elizabeth wore an heirloom tiara on her wedding day: the diamond fringe tiara that had been made for her grandmother, Queen Mary, in 1919, using stones from a Collingwood tiara/necklace that was given to her as a wedding present by Queen Victoria. Queen Mary wore the original tiara on her wedding day in 1893. The new tiara was made by Garrard. Mary had given the fringe tiara to her daughter-in-law, Queen Elizabeth (the Queen Mother), in 1936. The Queen Mum is the one who loaned the tiara to Princess Elizabeth for her wedding in 1947. (Queen Elizabeth II didn't inherit the tiara until her mother's death in 2002; the Queen Mother also loaned it to Princess Anne for her first wedding in 1973.) There was a bit of an infamous mishap with the tiara on the wedding day: as the princess was getting ready, the tiara frame suddenly snapped. Garrard was able to repair it, but you can see a gap in the tiara from the quick fix in the portraits from the wedding. Pearls are a staple in Queen Elizabeth II's jewelry wardrobe today, so it's no surprise that she wore a two-stranded pearl necklace on her wedding day. These pearls, though, are particularly special. They're actually two separate pearl necklaces, always worn together, that have been in the family for generations. If family tradition is correct, they're among the oldest pieces of British royal jewelry still worn by the Queen. The smaller strand, made of 46 pearls, is said to have been worn by Queen Anne, the last Stuart monarch. The longer strand, which includes 50 pearls, is attributed to Caroline of Ansbach, the queen consort of George II. The Royal Collection confirms that Queen Victoria's jewel inventory of 1896, made by Garrard, notes the pearl necklaces and is the first recorded statement of their Stuart/Hanoverian provenance. But as with the diamond tiara, there was a bit of a mishap with the pearls on the wedding day, too. They had been exhibited with Elizabeth and Philip's other wedding presents at St. James's Palace, but no one had gone to retrieve them before the wedding. (The display of the bejeweled presents, including the pearls, is above -- surely you see some familiar baubles there!) With the clock ticking, Elizabeth's private secretary, Jock Colville, headed out of Buckingham Palace to fetch the pearls. Those of you who know your London geography are aware that there's not a huge distance between the two palaces -- but add in the crowds gathered on the morning of a future queen's wedding, and you've got a bit of an obstacle. First, Colville borrowed King Haakon VII of Norway's limousine to try to fight his way through the crowds, but the car wasn't able to get him there quickly enough. Ditching the royal limo, he ran the rest of the way on foot. He made it back to Buck House with the pearls in the nick of time. 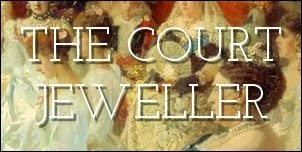 Colville was knighted for his various services to crown and country in 1974, and surely his rescue of the wedding pearls had to have been among the valiant acts that qualified him for the honor! Like the rest of the jewels worn by Princess Elizabeth on her wedding day, her diamond and pearl cluster earrings were also family heirlooms. The earrings date to the first half of the nineteenth century; they were originally owned by Princess Mary, Duchess of Gloucester, one of the daughters of King George III. She bequeathed them to her niece, Princess Mary, Duchess of Teck in 1857; in turn, the Duchess of Teck bequeathed them to her daughter, Queen Mary, in 1897. The earrings originally included detachable diamond and pearl pendants, but those were made into a separate pair of earrings by Queen Mary. The cluster earrings were relatively new to Princess Elizabeth's collection. Mary had given them to her granddaughter less than a year earlier, in January 1947, on the day that the royal family left for their tour of South Africa.